I joined the Carleton faculty in 1983. I received a B.A. (with a double major in Psychology and Economics) from Wellesley College, and an M.A. and Ph.D. in Psychology, and an M.S.E. in Computer and Information Sciences at the University of Pennsylvania. At Carleton I teach courses in developmental and cognitive psychology, as well as courses in introductory cognitive science. In past years, I also frequently taught introductory psychology and psychological statistics. I helped establish the Cognitive Studies concentration at Carleton, and serve as its coordinator. I also served as the Psychology Department chair from 1991-1994. I am the author of two textbooks Cognitive Psychology In and Out of the Laboratory, and Cognitive Development: Infancy Through Adolescence, as well as a trade book, Making Decisions in Everyday Life, and over two dozen journal articles. In my life outside of Carleton (Yes! I have one!) I am a mom to Tim and Kimmie. 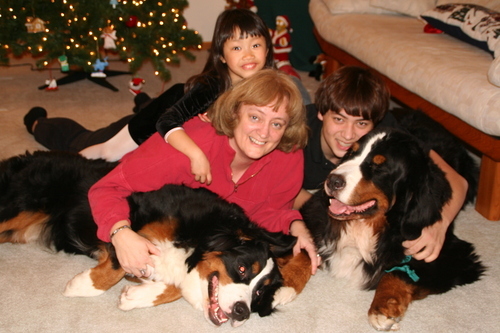 I also train Bernese Mountain dogs in obedience, and am a licensed obedience judge in the AKC and ASCA registries. Follow the links below to see course syllabi, publications and grants, photos and more information about my dog-related activities, and recent and not-so-recent photos of Tim, Kimmie, and the dogs!